Cook the couscous according to pack instructions, set aside to cool then fluff up with a fork. Next, make the Muhammara dip. Mix the breadcrumbs, half the walnuts, pesto, harissa and just enough water to make a smooth paste. Add 1 tbsp lemon juice and season to taste. Make a dressing by whisking together 1 tbsp each of the lemon juice, honey and rapeseed oil and pour over the couscous with the remaining walnuts. Finish by stirring in the dill and beetroot, season and set aside. Mix the oats with the lemon zest and a pinch of salt and spread out on a flat plate. Pat the chicken dry, coat each piece in the remaining honey then roll in the oats making sure all the sides are well coated. Heat the remaining rapeseed oil in a frying pan and fry the chicken in 2 batches for 3-4 minutes on each side until golden and cooked throughout. Serve on a bed of the couscous with a generous dollop of the dip. This is a cheat’s version of delicious Muhammara: a gutsy walnut-chilli-red pepper dip, which traditionally involves grilling and skinning lots of red pepper. 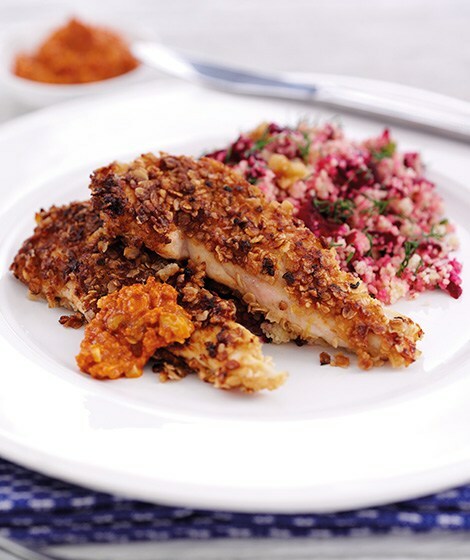 Using red pepper pesto is a shortcut which adds a really interesting set of flavours too.